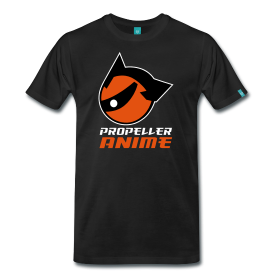 Propeller Anime: Local Black Friday Deals! Anime Orlando Inc. Is Orlando's Only Anime Store! 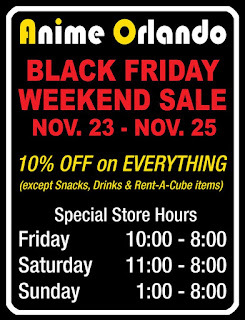 Anime Orlando Inc. is doing is going to have it's first Black Friday ever and they are offering 10% off almost all of their items! Not bad! They have all sorts of merchandise such as model kits, mugs, tea/sake cups, posters, manga, toys, wigs, and more! Outside of the sale, you can still get snacks and newly arrived gift cards! Anime Orlando Inc. is located at 9645 E Colonial Dr. suite 111, Orlando, Florida 32817 and you can RSVP to the sales event here. The Home Of Orlando's Mightiest Anime Club! A Comic Shop, which home to our monthly Anime Nite @ The Geek Easy, has all kinds of stuff going on tomorrow! They'll open up early at 9am and if you are one of the first hundred people there, you choose a FREE issue from one of several Marvel Now #1 comics. That's not all, true believers! Everything is on sale at the store. It's either 25% off or buy 2, get 1 free! And if you spend over $50 there tomorrow, you can pick from a selection of Batman graphic novels and get one for free! That's awesome! A Comic Shop is located at 114 S. Semoran Blvd Winter Park, FL 32792. You can RSVP to the sales event here. One of the most compelling Black Friday sales is from a convention team-up. 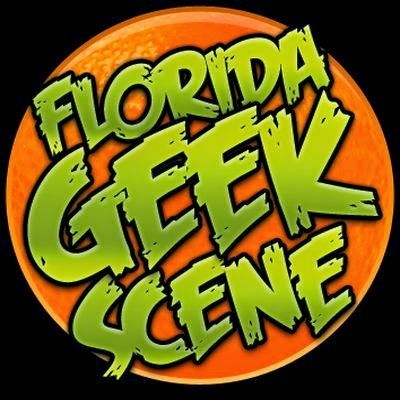 Just after midnight at 12:05am, it will be possible to get passes to next year's Anime Festival Orlando in August and Florida Anime Experience in May for as low as $50. That's like buying a pass to AFO and going to FAE for free! Tickets are limited for this BOOM (Bringing Orlando's Otaku More) sale are limited and you can order them here. 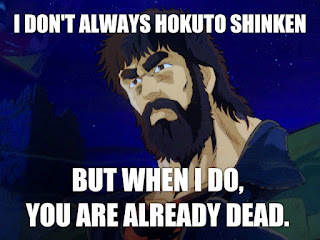 Make sure you check out all the sales we just mentioned and be sure to come back here this weekend for our holiday gift guide for the must-get anime, manga, and toys to get those you care about this holiday season!